This week’s meat-free Friday recipe is adapted from a Michael Lomonaco recipe I found on the Today Show’s website. Perfect for a cool winter day; be sure to pair with cornbread! 1) Heat oil in a large pot. Saute chick’n tenders, onion, red pepper until tenders are slightly brown. 2) Add cumin, chili powder, garlic, green chilis, and tomatoes. Saute for another couple of minutes. 3) Add vegetable broth, plus 2 cups of water. Simmer for about 20 minutes. 4) Add hominy and continue to cook until warm. Enjoy garnished with cilantro, green onions, and sour cream! We adopted a stream–and it’s pretty sick…. The saga continues! Last winter, our family attended a stream monitoring session in Accotink creek. After that experience, we decided that we too wanted to volunteer and adopt our own stream. I took the stream monitoring training sponsored by the Northern Virginia Soil and Water Conservation District, and we were assigned a stream in Eudora Park in Fairfax County, VA. Our first stream count was a little disappointing – we only found 21 invertebrates. But hope springs eternal, and we looked forward to the Fall count! 1) Erosion – Often, in developed areas, we try to channel water to specific waterways, rather than allowing the water to flow through smaller streams, floodplains, wetlands, or other soil on its way to the larger tributaries. We bury smaller streams to allow development and move the path of the stormwater. Additionally, hard surfaces (roofs, roads, sidewalks) keep the ground from absorbing water. By shunting stormwater to just a few streams, we really increase the speed and power of water as it moves through these streams. If you see a stream bank that looks like this, you’ve got a seriously eroded stream. Our walk back home after our stream monitoring session was a quiet one. Needless to say, we were disappointed and sad to see the condition of our stream. This is a great illustration of why we greenmomsters need to get involved, change the status quo, and protect our children’s environment. Is there hope? Yes! Our local Soil and Water Conservation District is working hard to restore and stabilize eroded stream banks. Additionally, folks are organizing to save the streams that are still healthy. Northern VA was host to such an effort recently when a group of concerned citizens saved “Tyson’s Last Forest” from a popular highway project. It can be done! We’ll keep you posted regarding our stream (we may be assigned a new stream). See you in the spring! It’s the day after Thanksgiving, and you still have LOTS of leftovers. There will be no experimenting with meat-free recipes. So instead, today I’m posting a terrific seasonal recipe for persimmon bread that you can pair with some hard-boiled eggs and a fruit salad for a delicious holiday weekend breakfast (yes Thom, I know breakfast breads are always meatless!). For this bread, I’ve adapted a David Lebovitz recipe that he adapted from Beard on Bread. Photo is also from David Lebovitz. Make lots of this bread – it freezes well! Have a great holiday weekend! 1) Grease two loaf pans. Preheat oven to 350. 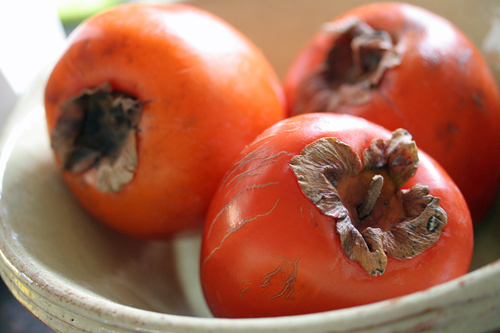 3) Make a well in the center of the dry ingredients and add butter, eggs, orange juice, and persimmons. Stir well. 4) Add in nuts and raisins and stir again. 5) Bake 1 hour, or until a knife inserted in the center comes out clean. Looking out at the environmental landscape, I’ve seen a few biodiversity headlines for which I’m very grateful! Mountain Gorilla Population Increase – World Wildlife Fund reports that the mountain gorilla population has increased by nearly 100 individuals in the past two years! Illegal Logging Decreased in Monarch Wintering Grounds – In August Earth Week reported that, due to increased patrols, aerial patrols showed no loss of forest in the Michoacan butterfly sanctuary this year. This is the first time it’s happened since the sanctuary was established in 2000! Red-Cockaded Woodpecker Population Increase – From 1993 to 2006, active clusters have increased from around 4,000 to over 6,000! America’s Largest Marine Sanctuary is Now Even Bigger! In October, NOAA finalized the expansion of the Fagatele Bay National Marine Sanctuary in American Samoa. Now called the National Marine Sanctuary of American Samoa, the protected area is as large as the state of Maryland! U.S. Fish and Wildlife Service. 2012. Red-cockaded woodpecker recovery website. Accessed 10/19/2012. http://www.fws.gov/rcwrecovery/. This week, I’m grateful for gorillas and the good news about their protection! The western lowland gorilla (Gorilla gorilla gorilla – see photo), is a relatively small gorilla (4-5 1/2 ft tall and up to 440 lbs) that lives in the dense rainforests of Cameroon, the Central African Republic, the Democratic Republic of Congo, Equatorial Guinea, Gabon, and the Republic of Congo. The mountain gorilla (Gorilla beringei beringei) is also a smaller gorilla that lives in mountainous regions with altitudes of 8,000 to 13,000 feet in the Democratic Republic of Congo, Uganda, and Rwanda. The mountain gorilla’s fur is thicker than that of its lowland cousin, but both have a primarily herbivorous diet and live in complex social groups. About half of the mountain gorilla population (estimated at about 700 individuals (National Geographic 2012) is found in the Bwindi Impenetrable National Park in Uganda. The western lowland gorilla sub-species is critically endangered. Exact population numbers are not known, because it’s so difficult to get into their habitat. What is known is that the population seems to have decreased by up to 60% in the last 20 to 25 years. Threats to the lowland gorillas include poaching and disease (the Ebola virus). The good news is, as reported by World Wildlife Fund on October 11, the Republic of Congo announced that it will designate over 7 million acres of wetland areas such as marshes, wetland forests, and lakes to protect the western lowland gorilla and other species such as chimpanzees, African elephants, and hippos! This brings the total protected wetlands acreage in the Republic of Congo to 29 million – about the size of Ohio! The mountain gorilla is also critically endangered, threatened by war, habitat loss, disease, poaching, and charcoal making. But there’s good news here too! The World Wildlife Fund reported on November 13 that “a recent census by the Uganda Wildlife Authority identified 880 mountain gorillas, an increase from the 786 estimated in 2010.” (WWF 2012 Mountain Gorilla). What can you do to help? Go to the World Wildlife fund website or check out this list of organizations working to protect the gorillas and their habitats. Interested in weekly endangered species updates? Be sure to “like” us on Facebook! Scardina, J. and J. Flocken. 2012. Wildlife Heroes. Philadelphia PA, Running Press Book Publishers. 264 pp. Meat-Free Friday–Dianna’s Down and Dirty Swimming Rama! This week’s recipe comes to us from my good friend (we’ve known each other since 8th grade!!!) Dianna -- mother, mid-wife, and labor and delivery nurse extraordinaire! When Dianna isn’t busy with her family or welcoming new babies into the world, she’s often sharing her recipe ideas on Facebook. This week, we benefit from the culinary creativity of our fellow greenmomster, Dianna! 1) Saute Chick’n tenders in olive oil until slightly browned. Remove from pan. 2) Combine peanut butter/peanut sauce, vegetable broth, chili sauce and red pepper flakes in pan. Simmer until thick and well-blended. 3) Add chickpeas, chick’n tenders, and spinach to the peanut mixture. Warm for 10-15 minutes, stirring occasionally until spinach is cooked. Enjoy over rice! Beginning tomorrow, November 14, at 8pm, the Climate Reality Project will begin a 24 hour presentation on climate change and what the group calls “Dirty Weather.” This live online broadcast will include information about climate change and what we need to do to change the future. As stated by the Climate Reality Project, “this event will put a spotlight on every region of the globe — featuring news, voices, and multimedia content across all 24 time zones. Every hour will be different. You’ll hear from experts, musicians, comedians, and everyday people about the impacts of climate change on their lives and homes.” This 24 hours is going to be a great chance for greenmomsters to learn about the science behind climate change, the impacts of climate change, and what we can do to limit its impacts on our global environment. I hope you’ll be able to join me in watching at least part of this important presentation! This week’s endangered species is the pygmy hippopotamus (Choeropsis liberiensis), which is listed as endangered on the IUCN red list. Only a hippo could be considered the “pygmy” of its species at 350-600 lbs! This shy, solitary, nocturnal animal is found in western Africa, where it lives in forests near streams. Similar to the larger hippo, pygmy hippos can shut their eyes and ears underwater, but their feet are not as webbed as their larger cousins. The pygmy hippo is a vegetarian that has a stomach with four chambers to help break down cellulose found in the plants it eats. Here’s an interesting factoid: The pygmy hippo wanders through its range, following well-defined trails, spreading its feces by spinning its tail while defecating. Hippos even have hairs with split ends on their tails to assure maximum “fling” of its feces! Pygmy hippos reach sexual maturity at around 4 to 5 years of age, and gestation lasts about 6 months. The young cannot walk at first, so the mother hides the young in streamside vegetation while she feeds. The major threat to pygmy hippos is habitat loss due to logging, farming, and other human development, as well as political instability in the region. This fact answers the question, “Why should we care if pygmy hippos are endangered?” Because if they’re declining because of loss of forests and streams, that means every animal, including humans, that depends on forests and streams is also impacted. Forest habitats help to store and clean water, as well as provide homes for many species in the local food chain. See a baby pygmy hippo take her first swim! Longing for a little more hippo entertainment? Enjoy! Lewison, R. & Oliver, W. (IUCN SSC Hippo Specialist Subgroup) 2008. Choeropsis liberiensis. In: IUCN 2012. IUCN Red List of Threatened Species. Version 2012.2. <www.iucnredlist.org>. Downloaded on 10 November 2012. San Diego Zoo. 2012. Mammals: Pygmy Hippopotomus. http://www.sandiegozoo.org/animalbytes/t-pygmy_hippo.html. Accessed 11/10/2012. YouTube.com. 2006. Hippo Singing the Lion Sleeps Tonight. www.youtube.com/watch?v=AY2HPvoqSTE. Accessed 11/10/2012. 5 Reasons Monarch Butterflies are cooler than the British monarchs! This week’s endangered species isn’t actually listed as endangered, but it’s a fascinating creature that’s currently threatened by several human activities. It’s the Monarch Butterfly (Danaus plexippus). Greenmomster’s earlier post on this fascinating insect can provide you with all of the basics about the species, as well as ways in which you can support their protection. One monarch butterfly can fly the entire distance from Canada to its wintering grounds in Mexico – no map needed. When it’s time for a caterpillar to become an adult butterfly, it surrounds itself in a chrysalis, totally liquifies, and comes out a “beautiful butterfly” (to quote Heimlich from A Bugs Life (image from allmoviephoto.com). I don’t know too many people, royals or not, who can successfully liquify themselves with no ill effects. Monarch butterflies eat cardiac glycosides (poison to many animals) while they’re caterpillars, making the butterflies’ bodies poisonous to predators. Monarch butterflies complete a transcontinental migration annually using 3 to 5 generations of butterflies! So you slept through science class, part 4–Why do the leaves change color in the fall? It’s one of the most beautiful times of year – the leaves are turning spectacular colors (especially if you live in New England) and there’s a little chill in the air. So the environmental science question of the day is one that you might know the answer to, or maybe your kids asked you and you didn’t know the answer: Why do the leaves change color in the fall? If you’d like to give a better answer than, “the trees are going to sleep for the winter,” it’s pretty simple if you remember a few little facts. Leaves, like all living matter, are made up of cells. Cells are made of molecules. Inside of the cells of leaves are pigment molecules that capture light energy to turn into food for the tree. Different pigments capture different wavelengths of light. The pigment molecule that gives trees their green color is called “chlorophyll.” But there are other pigment molecules helping to trap other wavelengths of light – we just don’t see them, because they’re dominated by chlorophyll. Trees have to actively produce chlorophyll throughout the growing season; this production takes energy. As day length decreases in the fall, trees stop making chlorophyll (it’s kind of the tree’s own cost/benefit analysis). The molecule breaks down and the other pigments that have been in the leaves all along become visible! Want a more detailed explanation of our fall foliage fireworks? Check out this great U.S. Forest Service website!